Big things are changing for award-winning journalist Elaine Weltworth. 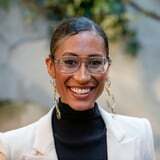 A little over a year ago, the activist was resigning from her position as the editor-in-chief of Teen Vogue, where she was the youngest person and the second person of color to hold such a position at any publication. Since then she's been covering major news events like March For Our Lives in partnership with Freeform and ABC News, walking the Oscars red carpet, interviewing Oprah, and - oh yeah - writing a book and becoming a new judge on Bravo's Project Runway. A very chill way to start off 2019, no? Even with all of the work and projects that she juggles, Elaine has remained consistent in prioritizing her mission of sharing the stories of marginalized groups and uplifting those around her. "I think of all the people in the community that I represent, essentially. I know that the work that I'm doing is not just for me," she explained to me over the phone recently. "It's for so many people who might never have the microphone. So if I have it, I've got to use it. And I have to use it to amplify those voices and those marginalized perspectives." Whether she's sharing an inspirational post on Instagram or encouraging people to make up their own rules for life, she's a source of motivation and encouragement for those who follow her - especially women who are trying to find their own voices in a world that seems to constantly be trying to silence them. On March 4, Elaine joined activist and model Cameron Russell in an empowering conversation about the importance of women finding their voice in honor of International Women's Day. The event was hosted by Keds in partnership with The Wing, a female coworking space collective headquartered in New York City, and was moderated by The Wing's head of diversity and inclusion, Yari Blanco. Elaine continued the conversation with me over the phone, where she shared what Women's History Month means to her, the significance of finding your people, and how her desire to learn more about other people's stories led to her own book, More Than Enough. POPSUGAR: Women's History Month is such an meaningful time for women and society in general. If you had to explain the importance in your own words, what would you say? Elaine Weltworth: I think that we're living in a world where we finally recognize the power of women supporting women. And the idea that we're celebrating that for a month and focusing on the power of what it means to collaborate with other women and to uplift other women's voices is just really special. At the same time, I think, every day is sort of Women's Day and every month is Women's Month. I think especially now with some of the movements that have sprung up over the last year or so, I think we have banded together in a way that has - I don't know - sort of made this spirit of women's empowerment come alive in new ways. And so, I love the idea that we celebrate it in a sort of punctuated way this month. But I do think this is kind of a spirit that has sort of carried over month to month and hopefully year to year. PS: I totally agree! We're at a very tumultuous time as a society right now, and as you said, we have so many movements coming up where people find their voice and find a way to speak out about their experiences. But it can be really hard to find a way to speak out and claim your space among all of the white noise coming out. What is your advice for women who are trying to find their voice and make themselves heard? "I really believe in the power of having a girl squad, like a cheer squad, and a support system because we really can't do it alone." EW: I think it starts with having a small group of women. Cultivating a tribe of women or of allies who should validate your perspectives, give you space to air out your emotions, and help crack their narratives in the most effective way. I think anything worth doing is more effective through collaboration. And I know, certainly for me, I would never have found my voice in business or in my personal life if I didn't have a tribe of women who help validate my perspective, help empower me to believe in it, and kind of were there for me throughout the journey of exercising it. You know? Exercising your voice in the world. And it's not always easy. I really believe in the power of having a girl squad, like a cheer squad, and a support system because we really can't do it alone. PS: And how do you find motivation to keep going when you feel overwhelmed or you feel helpless, or you don't have your girl squad there to prop you up in a time of need? EW: I mean, this is going to sound, perhaps, lu-lu or a little spiritual, but I think of my ancestors as real, present sources of power in moments where I feel disempowered. I think of all that they went through and it puts my challenges today into perspective. Because what I've been through, what I'm going through, pales in comparison to the fights that they've already fought. And I think we owe it to them to keep moving forward. PS: Was there ever a moment where you realized how your work has affected other people's lives? Has there been a moment when someone came up to you and they were just like, "You changed my life!"? EW: Honestly, it happens anytime I'm around young people. There's an experience where I recognized the power of connection and what means to see somebody like you do something that you dream of. I often feel shook. [Laughs] I remember needing that example. I remember not having that kind of an example. And still today I know what it means to see people like Ava DuVernay soar in spaces where there are few of us in the door - let alone soaring and thriving. I mean, she's still a personal hero of mine and she's somebody I consider a mentor in my real life. But I still am in awe of her and what she is doing with her career and in the world. We're living in an age of social media where you have access to your idols in a way that you never did before. And I might not have ever known Ava DuVernay, I might not have known who she was or what the work is that she's doing, but luckily we have this platform where we can see each other shining and winning, or we can support each other. We can reach out to each other. We can slide into DMs. And recognize that there's a lot less separating us than there is connecting us. And I think that's really powerful. I mean, the first time I [realized my impact], it definitely happened while I was at Teen Vogue. It reminds me of when I met Beyoncé, when I was a very young journalist at Ebony Magazine. And I remember what it meant to be able to just sit in her presence and listen to a bit of her journey. Because it made me realize, "You're another woman who had a dream and went for it, and so am I." I think it reinforces this idea that we all have a dream. We can all dedicate ourselves to making it happen. PS: That actually brings me to one of my other questions. I think one of the biggest aspects of Women's History Month is women working together and realizing that they have a community. And I know mentorship is very important to you and you've touched on that in past interviews and on social media. How did you reach out to your own mentors and how would you encourage young women to find theirs? EW I think I was relentless in terms of reaching out to this one particular editor at the time whose career trajectory inspired me tremendously. I essentially just wanted to be her. I wanted to learn from her, and so I was really incessant about getting in front of her and having an opportunity to just absorb some wisdom from her. And I got really, really lucky to ultimately be hired by her and to start my magazine career working under her. But that's a bit of a Cinderella career story. I recognize that that doesn't always happen. And especially now. We live in a different day and age, even though I know it makes me sound like a dinosaur. It was like 10 years ago but the world's changed so much since then. This was before Instagram. This was before everyone was a multihyphenate or had DMs. I think now, because of the access to our mobiles, it means that they're being inundated by requests like that. And so I don't think the best approach is to ask anyone, "Can you be my mentor?" Because a real mentor has to have an investment in you. And it requires an investment of time that you can't deliver at scale, unfortunately. "There's no rule that says your mentor has to be older than you. They could be younger than you. They could be your same age." My best mentors over time have been my bosses. People who I ultimately served and I had the exposure to them day to day to learn from them. So I think working with women that you admire is paramount. Seeking out women in your business, in your organization, asking for informational interviews, and relationship-building is the best path to mentorship. But that being said, what I really encourage is peer-to-peer mentorship. There's no rule that says your mentor has to be older than you. They could be younger than you. They could be your same age. And some of the best - or my most significant - mentorships I had when I was at Teen Vogue or after, have been with women who are in my peer set. I think we can't underestimate the power of working with our peers. Especially with this next generation of young people who think outside the box and who move differently and who don't see the same barriers that previous generations are sort of defined by. The possibilities are infinite when two young people come together and dream together. So I'm always like, "Look to your left and your right. Check out your network." The resources in your network now, that you haven't really tapped into, versus focusing on someone who is maybe out of reach for you or too busy to really invest in you in a meaningful way. PS: One aspect of Women's History Month is dedicated to celebrating women's achievements. What is an achievement of yours that sparks the greatest joy within you right now? EW: My book. 100 percent. It's my baby and I'm about to give birth on June 11. [Laughs] And I'm really, really proud of it. It's the first thing that I've done that only I could do, that required a level of commitment and focus and intention-setting and follow through. Writing a book is a really all-consuming process that becomes very therapeutic. And also really pure. I'm excited about what it will do in the world. How it will sell out in the world. The friends that it will make. I sort of think of it as the table I'm building to invite people to come sit at it and eat from it. "This is sort of my offering to those people who are trying to figure out their identity, their purpose, and their path." And I really wrote it for girls, young people like me who came up in a world that was being disrupted and really had to kind of carve out their own path. And I really wish I knew more about other people's stories - how they did it and what they've learned. This is sort of my offering to those people who are trying to figure out their identity, their purpose, and their path. And this offering goes deeper than Instagram. It goes deeper than social media. It goes beyond what you can share in a few characters and a filtered image. And I think we owe it to the next generation to tell the truth, good and bad. And I hope it starts conversations that really matter. And I hope it empowers other young people and women and women of color to know that their stories matter. I just think that there are infinite truths that are locked up in the stories women never tell. So as a journalist, I've been unlocking those stories, and now it was my time to tell a slice of mine. But the story's still being told, it's still being written. This is just one. This is the first book. This is my first offering. But I think that there's a lot more to come, there's a lot more life to live and there's a lot more to do. But I think there's also power in sharing what you know now. [Laughs] I'm just very proud of what this book hopefully will do in the world. It's called More Than Enough. I could talk forever about it, but I won't! Yeah. I'm also on Project Runway (which premiered on Thursday, March 14) which is also super exciting. It was a nice respite from being in the deep, deep, deep writing hole, where I was super isolated and in my head. To be able to come out of that and get glammed up and get inspired by the next big designers and work alongside people that I love, admire, and respect, and have a ton of fun with, was kind of a dream scenario.